Well, I thought that of all the colors a curry can have, I liked yellow ones the least – but it turns out I was wrong. This version is just as nice as its spicy red or green thai companions. 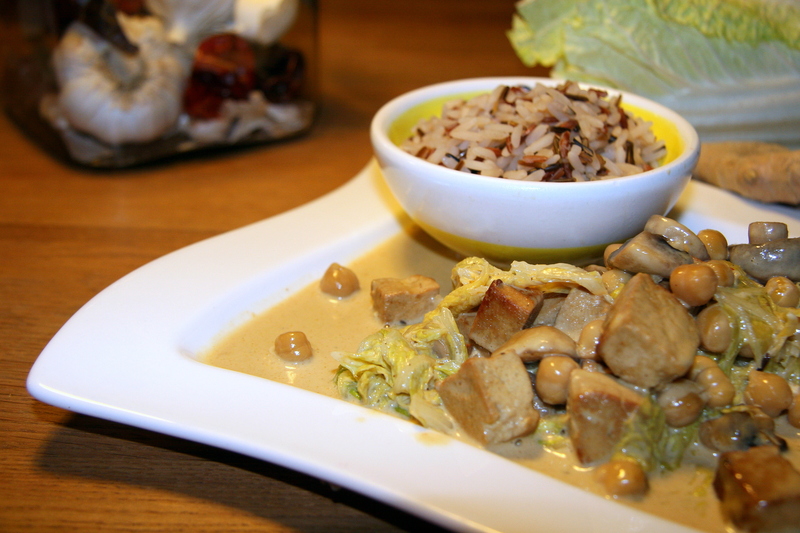 Again, feel free to throw in whatever veggies you like – I used mushrooms, chickpeas, Chinese cabbage plus marinated tofu. 1. Up to a day ahead, prepare the tofu. Slice the block into dices (of the size you prefer). In a bowl, add soy sauce and the above spices and ingredients plus salt and pepper to taste. Put in the refrigerator and stir from time to time. 2. To start the actual dinner, fry your tofu first. Put it in a frying pan with some or lots of oil (again, that’s up to you!). Fry for about 10 minutes, or until lightly brown. 3. Add mushrooms, ginger and garlic. Fry for another 5-7 minutes. Then add the spices and tomato paste. 4. After 30 seconds or so, add the chickpeas and coconut milk. Add the cabbage leaves. Let simmer for a couple of minutes.